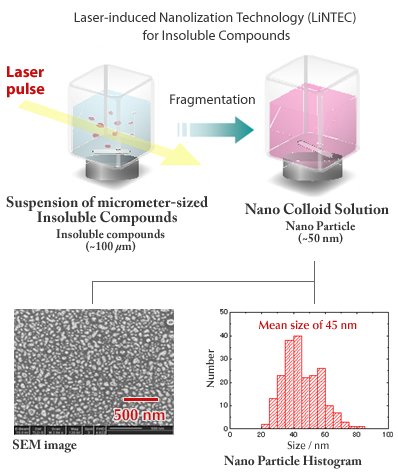 Laser-induced Nanolization Technology (LiNTEC) is a platform technology that prepares long term stable nanoparticles of active pharmaceutical ingredient (API), resulting in greatly increased surface area and much improved solubility. Particle sizes are tunable and typically ranging from 1 to 300 nm. It is an effective solution to poor water-solubility problem and enables product opportunity of new formulation and delivery format. 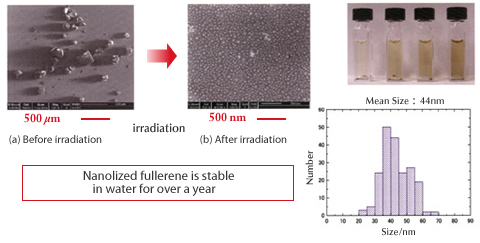 LiNTEC has been developed in Professor Masuhara’s Lab of Osaka University. LiNTEC prepares nano particles with a mean size of 45 and a SD of 20% after irradiating the insoluble compounds in water by laser pulses.